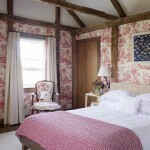 When most people imagine wallpaper, the first thing that comes to mind is the image of a pattern that is flat and repeating created to hang from ceiling to floor. Usually one of the most unobtrusive patterns is that of the vertical stripe. Striped motifs in wallpaper can add a stunning elegance to many different interior settings. Stripes are an extremely versatile pattern. This motif has the advantage of being a timeless design, some wallpapers can have the effect of looking very passe after a few years but stripes are relatively timeless. 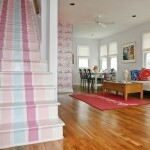 Another advantage of striped wallpaper is that it does not impose a style on a room. Stripes work just as well when combined with a country feel as with antique furniture or a modern contemporary vibe. Here we have a master bedroom with visually arresting broad vertical lines in a muted taupe with a close arrangement of matte and shiny textures. The effect and character of a striped wallpaper is more defined by it’s combination of colors than by the width or arrangement of the stripes. In this next example you will see how the mixture of the strong and deep reds combined with white creates a more sophisticated effect, which in turn is a great background for vintage style furniture and fittings. By contrast in this next example note how the light beige colored vertical stripes when combined with white creates an entirely different mood, that while still somewhat sophisticated it is now fresher with a sunny informal style. This next room in beautiful stripes and yellow hues contains Empire stripes with different colors and widths which bring and element of vitality to the walls. Note how the pattern is continued in the fabric of the chair making it the central theme of the room. The pale yellow and white striped pattern with dashes of green creates and airy, fresh and light filled room. You can also break the rigid symmetry of the hard stripe by alternating plain stripes with a floral pattern or a geometric design. In this next example the stripes are enlivened by the lively richly textured floral pattern. This entry was posted on Friday, April 15th, 2011 at 10:36 am	and is filed under Bedrooms, Decorating. You can follow any comments to this entry through the RSS 2.0 feed. You can leave a comment, or trackback. i’m really wanting the red/white striped wallpaer shown above. do you per chance know what brand it is?